The life changing technology that had families huddling around a box in their living rooms, bonding over Saturday night programs. However, the way television has been viewed and engaged with has changed over the years. Soon, this primitive technology evolved into commercially available home TV sets, accessible, at first, only as fancy toys for the wealthy. 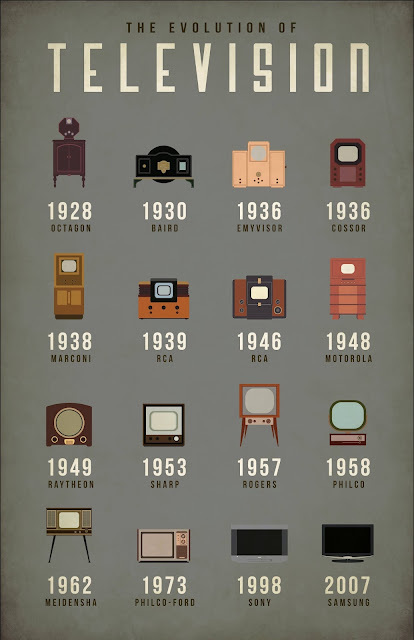 Designers knew how revolutionary television would be, and advertisers milked the technology’s novelty in ways that may now seem kitschy and dated: as the 1936 Cossor Television was advertised in a brochure: “Radio–its thrills, its interests, increased one hundred fold by Television... Radio is blind no longer. The most exciting running commentary is made immeasurably more thrilling when you can SEE too!” The Cossor came in a walnut cabinet of sorts, its screen hidden by doors when not in use–a design feature that was largely retired in later designs, as were round screens, seen in 1949’s Raytheon TV, and the built-in legs seen on sets in the ’50s and ’60s.